As most of you know it is usually a good thing to have a happy wife. Well I am just finishing up a few projects that are helping to make my wife a little happier. 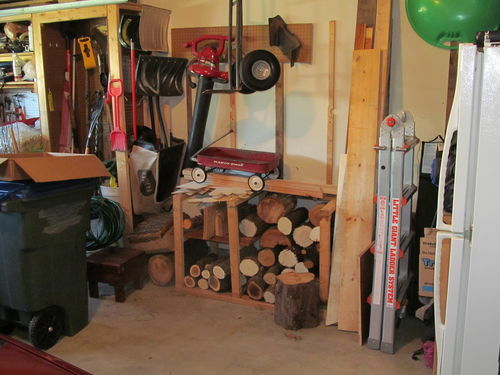 Some of you know I have a basement workshop, I keep some of my wood though upstairs in the garage (same place my wife parks everyday). Well the wood was getting a bit out of hand. Note my sheet goods on the far right side. One of my drying piles. So a few weeks ago I tackled the sheet goods side. I got rid of a few things and then attached a 2×4 to the floor with Tapcon screws. The strap just makes sure everything does not fall over. The system works quite well and we gained several inches on that side of the car, which is good because that is where my daughter is always getting in. 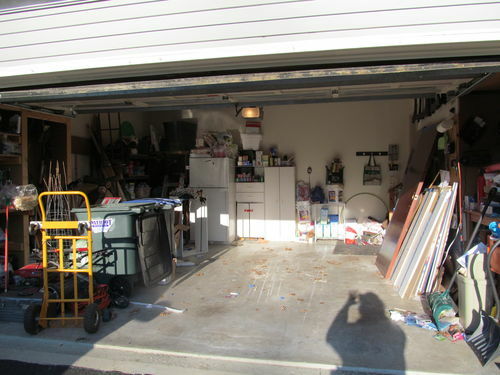 Today I tackled the other side of the garage. Moved a few shelves around for our back up pantry and then used a bunch of scrap that was piled under those logs to build a rack. Nothing fancy at all, but it seems to work fine. With that pile tamed we gained alomost a foot on her side of the car. I have a pile of wood outside that I am going to tackle with my new chainsaw and cut to more manageable pieces. More then likely will move them downstairs and get them cut down into pen blanks mainly. So there you have it an easy way to make the the wife happier :). Thanks all for looking. if mama’s happy everybody’s happy. 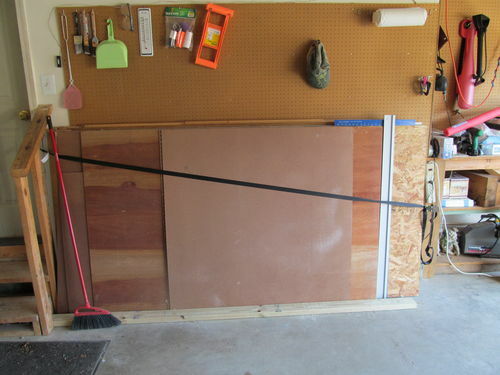 @ Monte trust me I would love to have a panel saw or a bandsaw in the garage but I keep everything in the basement and all is well. TRABAJASTE DURO Y ESO SE VE!!!!!!! Chris, I just had to make that funny. 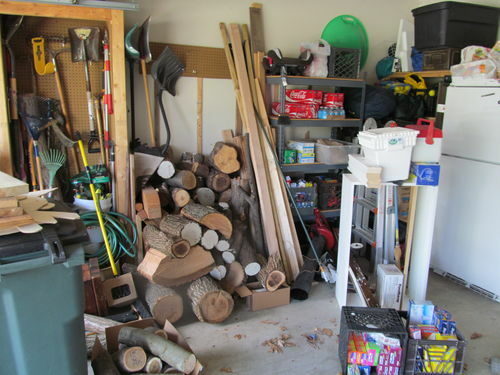 As for building something to help in my wife’s work area, that one I did do and it make her a happy camper. She got into embroidery and I built her several differently sized tables for her machine, computer, added work area. Now she is talking about a dresser for material storage even though I had suggested a wall cabinet. So I am in the planning stages for that. @Kova- Gracious. I have not forgotten about you and your daughter, just got busy. Ahh.. if only my wood pile still looked like the above picture. Time to get back into the garage.